For securing hardwood strip flooring to subfloor and to secure wood framing or furring strips to brick, block or concrete. Wide side of nail should always be driven parallel to the grain of the wood. For attaching wood to cinder block, mortar joints, brick walls, and fresh concrete. Blunt point and tapered shank reduce splitting. Used for foundry casting work, concrete form work and metal sculpturing. For trim and fine finishing work. Small diameter and cupped head for countersinking beneath the wood surface for filling and smooth finished appearance. Made to conform to ASTM F1667. "Used for general construction where thinner shank for driving ease is desired. Thinner than a common nail, but slightly heavier than a box nail of comparable length." "Extra-thin shank with standard head suitable for working with thin pieces of wood, such as crates or furring. Electrogalvanized nail commonly used to apply chamfer strip. 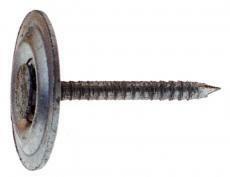 Hot dipped galvanized nail also known as ""lobster pot nails,"" as used to repair lobster crates. Also used for plywood in soffits and with cedar shingles." For anchoring housewrap, sheathing, and felt. Wide head and ringed shank for greater holding power. For applying roofing asphalt shingles, insulation board, and felt-to-wood substrates. Large head and heavier shank gauge provide greater holding power. For attaching joist hangers to wood studs. Short, heavy gauge nail provides increased holding power without fully penetrating wood. For attaching furring strips and floor plates to uncured concrete. Made to conform to ASTM F1667. 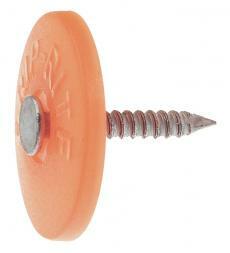 Metal Round Cap Masonry Nail for attaching foam insulation to exterior surfaces. Fluted to penetrate masonry without cracks. Used for fastening antique hinges and face-nailing doors. Provides maximum holding power for pallet construction and increased pallet life. Round, well-centered heads feed smoothly and efficiently through automated nailing equipment. Used to attach panel board to wood furring or studs. For cedar shake applications. Smaller head for concealment. Slender shank minimizes splitting. Checkered head reduces hammer slippage. For attaching thin sidewall shingles. Sturdy slim shank prevents splitting. Thinner shank and blunt point minimizes splitting. Ringed shank for greater holding power. Checkered head reduces hammer slippage. For attaching furring strips, clips, hangers, etc. to concrete block or mortared joints. For attaching vinyl siding. Oversized 3/8" head for increased holding power. For attaching wood and hardboard siding. Extra-stiff shank for greater holding power. Three-sided head and black oxide coating ideal for authentic restoration and antique effect. For laying plywood or composition underlayment over existing wood floors or floor joists. Ringed shank for greater holding power. For attaching truss plates. As multiple nails are commonly used with truss plates, truss nails are thinner than joist hanger nails to minimize splitting of the wood trusses. For attaching hardwood mouldings (a.k.a. hardwood trim nail or moulding nail). Brad-style head for ease of concealment. For attaching gypsum board to light-gauge steel studs. Made to conform to ASTM C1002. For exterior applications, including decks, siding, gazebos, and playsets. Countersinking bugle head prevents heads from popping out, leaves smooth finish. Type 17 point reduces need to pre-drill boards. Available in combination drive or star drive. For attaching overhead garage door hardware to metal.